On the occasion of the 74th birth anniversary of former prime minister Rajiv Gandhi, tributes poured in from several quarters, including Prime Minister Narendra Modi. 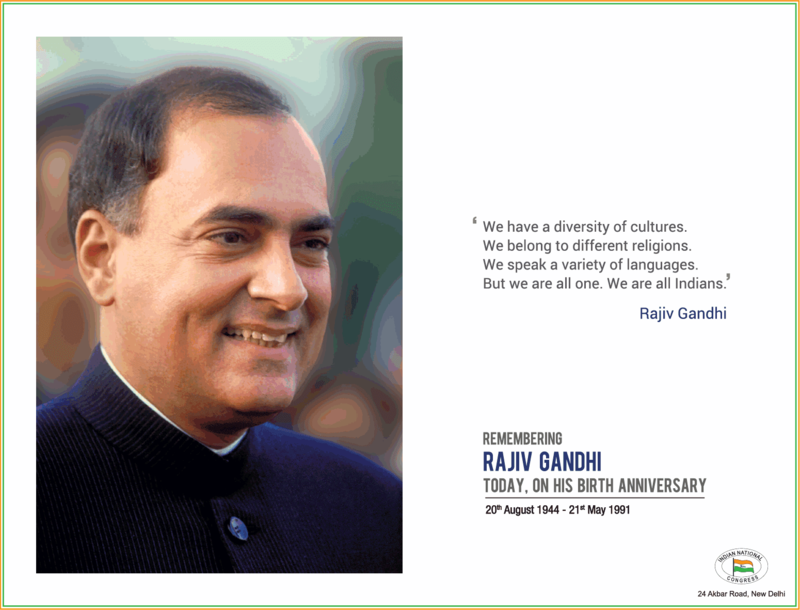 “Tributes to our former Prime Minister Shri Rajiv Gandhi Ji on his birth anniversary. We remember his efforts towards the nation,” Modi tweeted. Gandhi’s son, Congress president Rahul Gandhi also took to Twitter to remember his father as “a kind, gentle and affectionate man” whose passing had left a deep void in his life. “I remember the times we had together and the many birthdays we were lucky to celebrate with him when he was alive. He is greatly missed, but his memory lives on,” Rahul tweeted. Earlier in the day, Rahul accompanied his mother Sonia Gandhi and sister Priyanka Vadra to pay their tributes at Veer Bhumi. Sonia Gandhi, when conferring the Rajiv Gandhi Sadbhavna Award to former West Bengal governor Gopal Krishna Gandhi, who is also the grandson of Mahatma Gandhi, said that though her husband’s tenure in politics was short, he laid the foundation for IT, telecommunications and computers — paving the way for India’s entry into the 21st century. Also present in the meeting was former prime minister Manmohan Singh, who said that the values Rajiv Gandhi espoused, which are “a broad secular outlook, the spirit of tolerance, commitment to communal harmony and empathy to others” are those that define India’s nationhood.